By using the Manage Views settings within the Google+ mobile application you can customize your stream viewing while on the go. Google+ Circles “helps you organize everyone according to your real-life social connections–say, ‘family,’ ‘work friends,’ ‘music buddies,’ and ‘alumni’.” This becomes useful as your friends join, or you start following well known celebs or tech writers. Each Circle becomes it’s own stream on the Google+ website, allowing you to filter down to just the updates from the people in a specific circle. 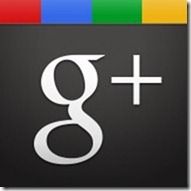 Many people don’t know that the same functionality exists on the Google+ mobile applications. 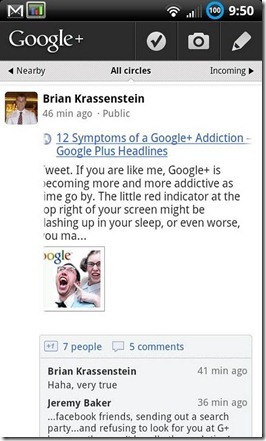 As more people join Google+, more people have begun using the Google+ mobile applications. Yes, they have their shortcomings (can I PLEASE get the option to re-share via the mobile app?) 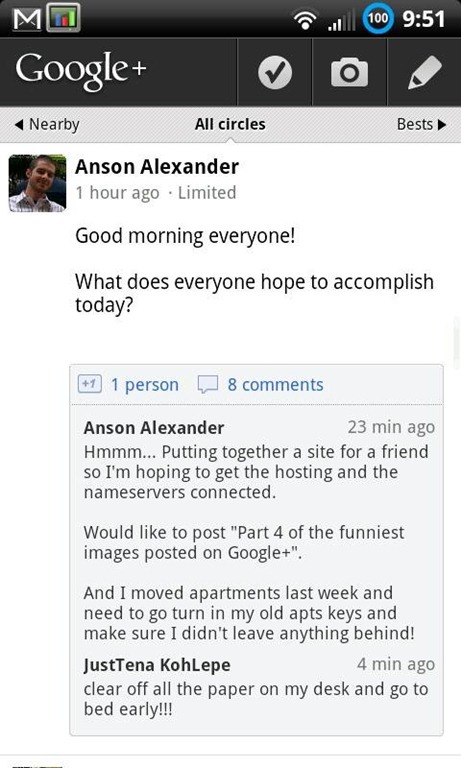 but as a whole the mobile application gives you the Google+ experience on the go. One of the main complaints with the mobile applications that I hear is that if you follow to many people, who post to often or lengthy posts, that the stream becomes overloaded and the mobile application isn’t as useful. 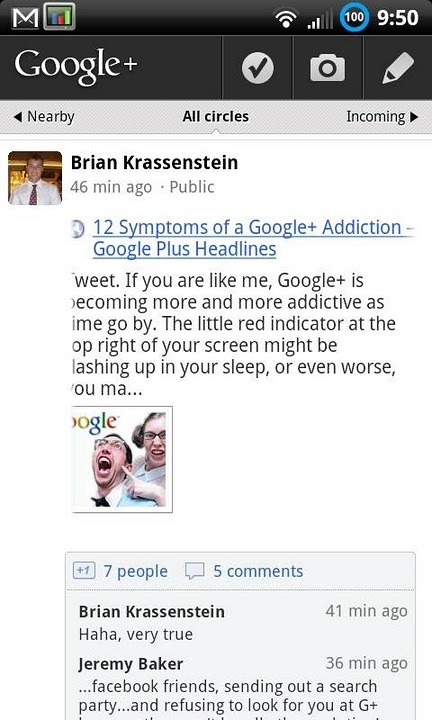 As Brian Krassenstein has already pointed out, Google is rapidly adapting to user concerns and usability and has just changed the way Google+ streams work on the web. What I’ve found is that many people don’t know they can manage the viewing of their streams on the mobile device; reducing the noise of the primary stream and letting them simply view posts from ‘family’, ‘work friends’, etc. To do so is really simple once you know where to look. Select your Circles – The next screen will show you a list of your Circles; you can select all of them if you’d like the ability to filter by every circle you’ve created or simply select the ones that you’ll most want to stay engaged with while on your mobile device. 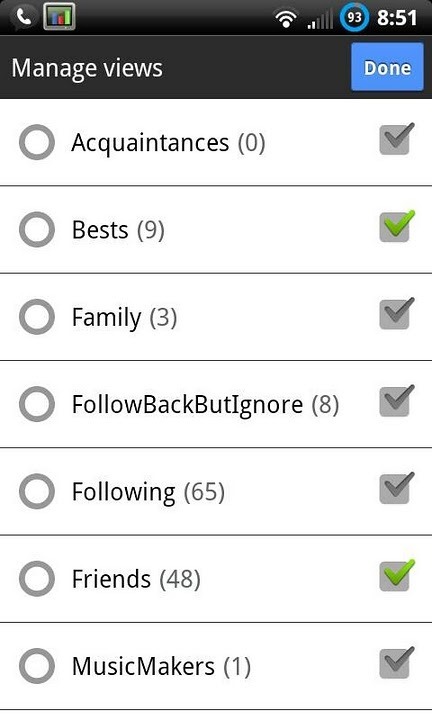 In the screenshots below you’ll see that I’ve selected my Circles for ‘Bests’ and ‘Friends’. Hit done at the top and you’re preferences will be saved. After you’ve selected your Circles in Manage Views you’ll notice a change to the main Stream view. On the top right, where ”Incoming” was listed, you’ll now see the that the incoming stream has been replaced by the first of your Circles that you selected in the Manage Views settings. You can now swipe your screen and have a customized stream for just the Circles you’ve chosen. The far left view will always display public posts of people who were nearby your current location, and the far right view will always display your incoming notifications.